In this edition, John looks at Brian O'Driscoll's Test captaincy record, beating World Cup holders, Ellis Park's name, John Hayes and early fullback Test tries. 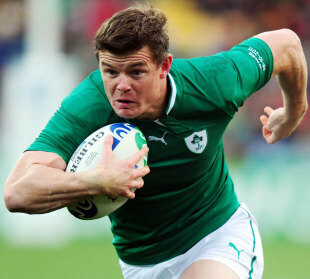 Brian O'Driscoll became the world's record-holder when he led Ireland in the third Test against New Zealand in Hamilton last month. That was his 83rd Test as Ireland's captain (equalling John Smit's record for South Africa). O'Driscoll, who first captained Ireland in the autumn internationals of 2002 (standing in for Keith Wood), has also led the British/Irish Lions in one Test: against New Zealand at Christchurch in 2005. He has therefore captained Test sides a world-record 84 times. No defeats as holders to date. New Zealand with 24 wins have the best record against reigning world champions followed by Australia (19) and South Africa (10). France lead the Five Nations with eight successes, England have seven, Ireland six and Wales three. Scotland have two wins and Argentina one. The Lions have won four Tests against world champion sides but only one Test series: against the Springboks in 1997. The ground isn't named after William Webb Ellis but a Mr Ellis who, many years ago, fought Johannesburg's city council when they wanted to convert the site of children's playing field into buildings. At length the Transvaal Rugby Union moved there during the 1920s when their former HQ at the (old) Wanderers ground was appropriated for the construction of Johannesburg's mainline railway terminus. The Transvaal RU were compelled to retain the "playground" aspect which is why it was developed with additional cricket, tennis and Olympic-standard swimming facilities. It staged its inaugural rugby Test during the 1928 series against the All Blacks who won 7-6 there in front of 38,000. The 'Boks got their revenge (12-6) on the 1949 All Blacks there, and in 1955 a then-world record crowd of 95,000 for a rugby match watched the British/Irish Lions win a pulsating first Test 23-22 on the ground. All told, the Springboks have played 44 Tests at Ellis Park, won 31, drawn two (both against the Lions) and lost 11. The former Ireland prop led a remarkably disciplined career. In more than a hundred games at the highest level for the Lions and Ireland, 212 competitive matches for Munster and countless senior club matches for Bruff and Shannon he was dismissed only once. His red-card came on October 3 2009 playing for Munster in a Magners League match against their old rivals, Leinster, at the RDS. He was dismissed for careless use of the boot at a collapsed maul after referee Simon McDowell had taken advice from his touch-judge. The law change became universal in September 1968 and revolutionised full-back play. Before then, the full-back's duties were to tackle, field kicks ahead and kick into touch. The ball could be kicked direct to touch from any part of the ground before the new law was introduced. Tries by full-backs were extremely rare at Test level. William Penny (for England against Ireland in 1878) and Tom Fry (for England against Scotland in 1880) were the first full-backs to score tries in internationals but it was not until 1934 that Vivian Jenkins became the first to score in a Championship match. He crossed in Wales's victory against Ireland at Swansea. The next full-back try in the Championship was by France's Claude Lacaze against Ireland in Paris in 1962 and the last was arguably the most famous before the law change. It was scored by 18-year-old Keith Jarrett on his debut for Wales against England at Cardiff in 1967. J P R Williams was the first full-back to make a habit of scoring Test tries, crossing six times in Five Nations matches in the 1970s.